He’s been crowned the King of fantasy writing and he’s currently on a world tour with the launch of book number one of his new series Firemane. Today we’re sharing our favourite titles from Raymond E Feist. Clear your weekend, because once you read one Feist book there’s no stopping you from wanting to read the rest, he’s an author whose books really encourage binge reading! This is the first volume in Feist’s epic heroic fantasy series, The Firemane Saga which is an electrifying tale of two young men whose choices will determine a world’s destiny. In a world engulfed by war, we are introduced to four young protagonists, Declan, an apprentice blacksmith and three friends being schooled in the deadly arts of espionage and assignation, Donte, Hava and Hatushaly. The destinies of these four youngsters are fatally entwined, as they are caught up in a web of lies, betrayal, love and danger, under the shadow of a prophecy that tells of an heir to the deadly Firemane magic. The Riftwar Saga comprises of three books; Magician, Silverthorn and A Darkness at Sethanon, and it’s his classic fantasy epic, Magician, which has enchanted readers for over twenty five years. At Crydee, a frontier outpost in the tranquil Kingdom of the Isles, an orphan boy, Pug, is apprenticed to a master magician — and the destinies of two worlds are changed forever. Suddenly the peace of the Kingdom is destroyed as mysterious alien invaders swarm the land. Pug is swept up into the conflict but for him and his warrior friend, Tomas, an odyssey into the unknown has only just begun. Tomas will inherit a legacy of savage power from an ancient civilisation. Pug’s destiny is to lead him through a rift in the fabric of space and time to the mastery of the unimaginable powers of a strange new magic. The Empire Trilogy was written by Feist and Janny Wurts and was the first fantasy trilogy that I have ever read…I had often rolled my eyes when someone recommended fantasy as a genre to read and I resisted it for years, until one day I picked up a copy of Daughter of the Empire…and was hooked within the first chapter. Magic and murder engulf the realm of Kelewan. Fierce warlords ignite a bitter blood feud to enslave the empire of Tsuranuanni. While in the opulent Imperial courts, assassins and spy-master plot cunning and devious intrigues against the rightful heir. Now Mara, a young, untested Ruling lady, is called upon to lead her people in a heroic struggle for survival. But first she must rally an army of rebel warriors, form a pact with the alien cho-ja, and marry the son of a hated enemy. Only then can Mara face her most dangerous foe of all in his own impregnable stronghold. An epic tale of adventure and intrigue. Daughter of the Empire is fantasy of the highest order by two of the most talented writers in the field today. Krondor’s Sons is a continuation series of two books following on twenty years after the Riftwar Saga. It begins with Prince of Blood. Prince of the Blood follows the adventures that erupt when a group of powerful nobles attempt to overthrow the Empress of Kesh, bitterly dividing the court. In the centre of the conflict are the two princes of Krondor, Borric and Erland. When Borric escapes and makes a desperate journey back tothe court to warn of the traitor’s plans – which if they were to succeed, would start a war that would twar the Empire apart. And when you have finished these titles, be sure to check out the rest of Feist’s titles here. In this #tedtalk Stokes asks for more movies that send positive messages to boys: that cooperation is heroic, and respecting women is as manly as defeating the villain. It’s a good watch. It’s Feist Day and we are getting our sci fi on!!! 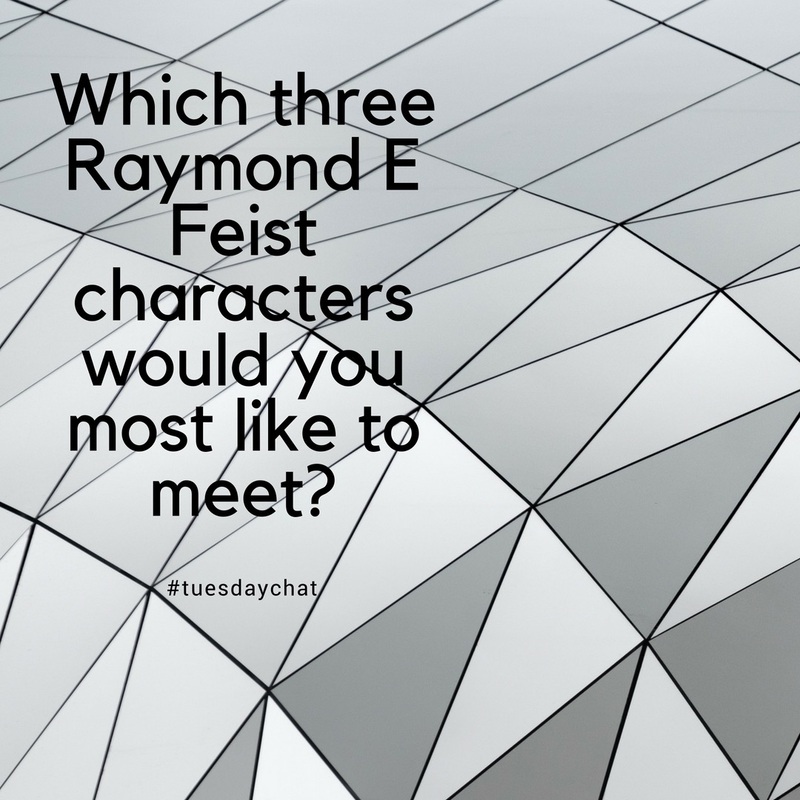 Which 3 Feist characters would you most want to meet? We’d pick Pug, Mara and Kevin of Zūn.